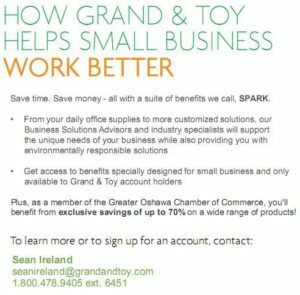 This booklet has been produced by the Greater Oshawa Chamber of Commerce, in cooperation with Economic Development Services of the CITY OF OSHAWA, to assist those individuals wishing to start a new business in the CITY OF OSHAWA. The information in this booklet should be used in conjunction with the book Starting a Small Business in Ontario, which is produced by the Ontario Ministry of Economic Development and Trade.Copies of the Ministry’s book may be ordered by calling 1-800-668-9938. A limited number are also available from Economic Development Services, City of Oshawa 905-436-5617. To download the complete Booklet click on the picture.